Edgar Solares Vega has a wide range of experience in the field of education. Solares Vega, who has served as assistant principal at Meridian Creek Middle School since it opened in 2017 and recently was named principal of Bolton Primary, earned his teaching certificate in Guatemala. He spent the next couple of months in the Central American country, where he was born and raised, teaching Spanish to tourists and Peace Corps volunteers, but soon made his way to the United States. Shortly after arriving, Solares Vega enrolled in classes at Portland Community College to learn English. "As I was learning things about U.S. culture, social dynamics of race relations, ethnicity and how that plays a role in how we experience the world here in the States, I thought 'Well, I know how to be a teacher. I have a certificate already. It might actually be a good thing for me to go into teaching here,'" Solares Vega said. He received his license and master's degree in education from Portland State University and began teaching in 1999. Solares Vega started as a fourth-grade teacher at Ainsworth Elementary in Portland. After three years there, he moved to the Beaverton School District. In his last few years in Beaverton, Solares Vega served as a Teacher on Special Assignment (TOSA), focusing on emotional support for elementary -school students. In this position, he got his first taste of educational administrative work, which he called "the best job in the world." 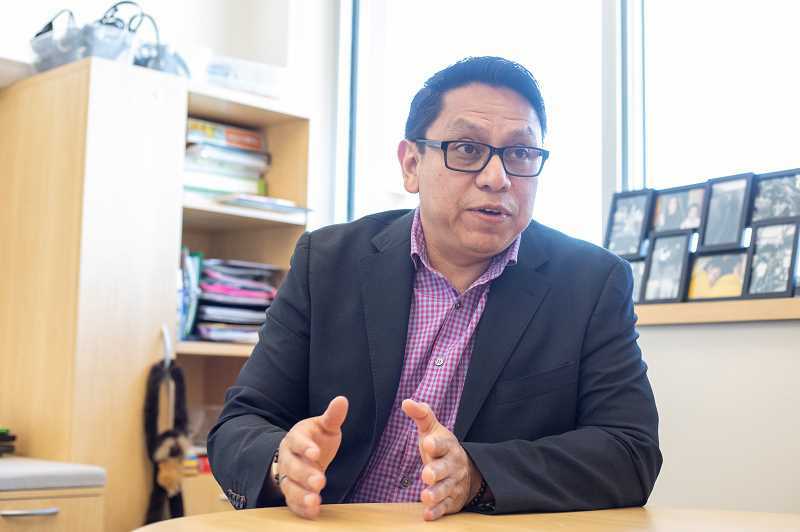 To officially become an administrator, Solares Vega pursued a doctorate in curriculum and instruction and educational leadership and earned his administrative license in 2016. A year later he took on the role of assistant principal at Meridian Creek. Solares Vega said it was difficult to even apply for the Bolton principal position because he loves being at Meridian Creek so much. "I love the culture that we're creating being a brand-new school," he said. "Very few administrators get a chance to open a school, so that experience alone made this opportunity incredible." From the get-go, one of the things he loved most about the culture at Meridian Creek was the inclusiveness. Within the first couple of days, he said he noticed kids going out of their way to include one another in games at break time, in discussions and group classwork. This inclusiveness, he noticed, rose all the way through the ranks of the district to West Linn-Wilsonville's top administrators. In his nearly two years at WL-WV, he has appreciated the district's "inclusive culture" and "constructivist ideals." "Last year and this year, I saw how the district is very intentional and all about bringing people in who they feel will support that vision and to make the district as diverse as it can be," he said. "Those are things that I appreciate very much, and I felt that from the beginning. I'm very happy. I feel very supported." Leading a school as principal has been a goal of Solares Vega's for a long time, and he is excited for the opportunity to do so from a school like Bolton. "I'm very honored and excited to become part of the Bolton community. The warmth that I felt, the positive energy I experienced when I visited with staff and students, was very welcoming," he said. "l look forward to continuing the great work that they've been doing as a community and finding ways to support that work and get better together."